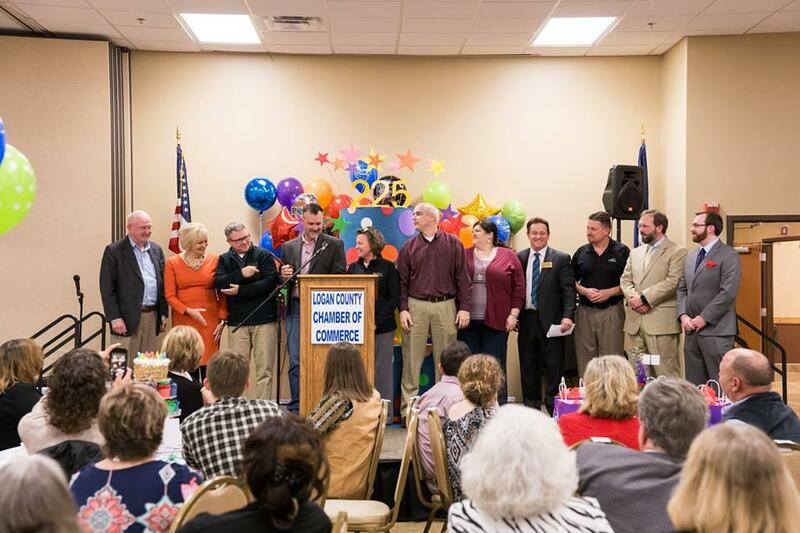 An emotional acceptance speech and a challenge from a past president were highlights of the Logan County Chamber of Commerce’s Annual Dinner last Thursday. 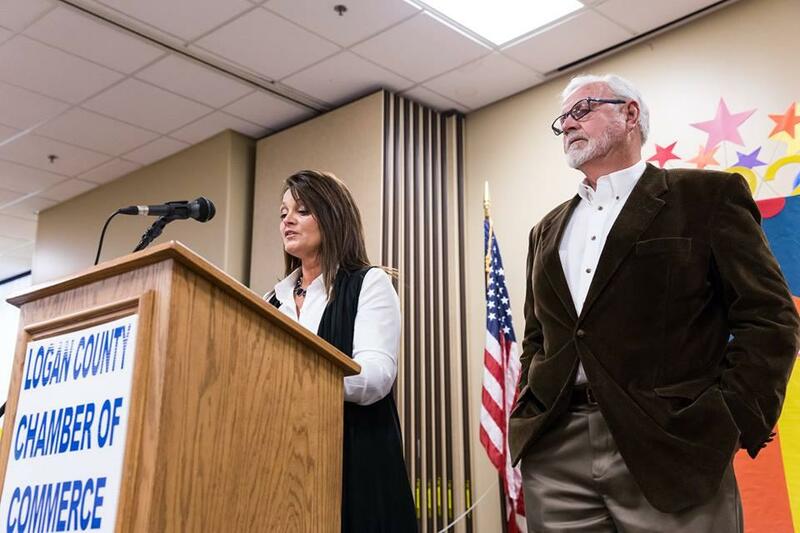 Colonial Inn owner Angie Chestnut Graham spoke about the challenges and joys of leading one of Logan County’s most iconic business landmarks after the restaurant located at the East End triangle of Russellville was named Business of the Year. The owner of the family business for 18 years, she talked about the example of customer service set for her by her parents, Jim and the late Norma Chestnut. She talked about her faith and her belief that trusting in God will make all things better. She said that the family moved to Russellville in 1979 when she was a child. They owned Burger Queen on the corner of West Third Street and North Main before selling it to Druther’s restaurants. After that they purchased what had been known as both Colonial Inn and Logan Heritage Inn over the years. The Chestnuts changed the name back to Colonial Inn, and their business grew as a popular gathering place and eatery, highlighted by a buffet filled with fresh-cooked foods. That popularity has not diminished. Norma Chestnut’s death almost 18 years ago led to their daughter Angie’s becoming owner and manager. “They always told me, ‘Angie, your best can be better,’ and I’ve tried to live and run the restaurant with that in mind,” she said. She thanked her husband, Ray Graham; her co-manager, Betty Young; her kitchen manager, Doris Brown; and her employees, many of whom were present, since Colonial Inn had catered the dinner. Her dad, Jim Chestnut, also spoke briefly. 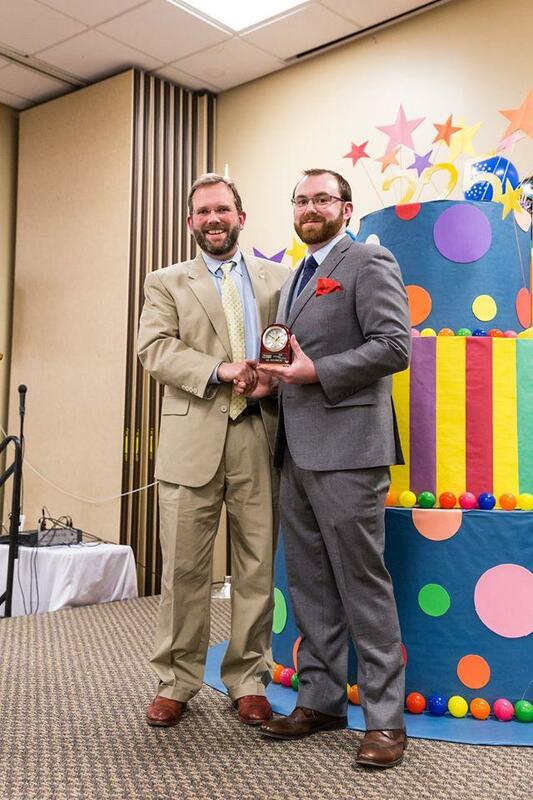 Former Chamber President Brent Summers presented the award. He also conducted a fund-raising auction later with the assistance of realtor Robert L. Brown, the always helpful Eddie Brooks, and Chamber Executive Assistant Karen Logan. After being honored by current President King Simpson, 2016 President Joe Hendricks thanked some of those who helped him during his year in office, including former executive director Ryan Craig and current executive director Tammy Tinsley along with Tobacco & Heritage Festival chairs Krystal Gunderson and Ben Kemplin and his executive committee—King Simpson, Shane Hayes, Ethan Holloway, Gary Grohovsky and Mandy Hendley. Long-time leader Mike McCormick was specially honored for his years of service. Hendricks drew on his own experiences as a graduate of Logan County High School who went away to college, practiced law in both the private and public sectors in Georgia, and then brought his family home to open a law practice with partner Ami Brooks in Russellville. He commended Logan Fiscal Court on its decision to purchase Wildcat Hollow campsite from the Boy Scouts. It has a large lake, many acres of green space, and buildings for meetings and lodging. Noting Logan County’s agriculture heritage, he said more spaces are needed for families to enjoy the great outdoors. “I hope fiscal court makes it a great place to play, helping make Logan County a nice place to live,” Hendricks said. The 2017 Chamber Board members were sworn in by attorney Elizabeth Teel. 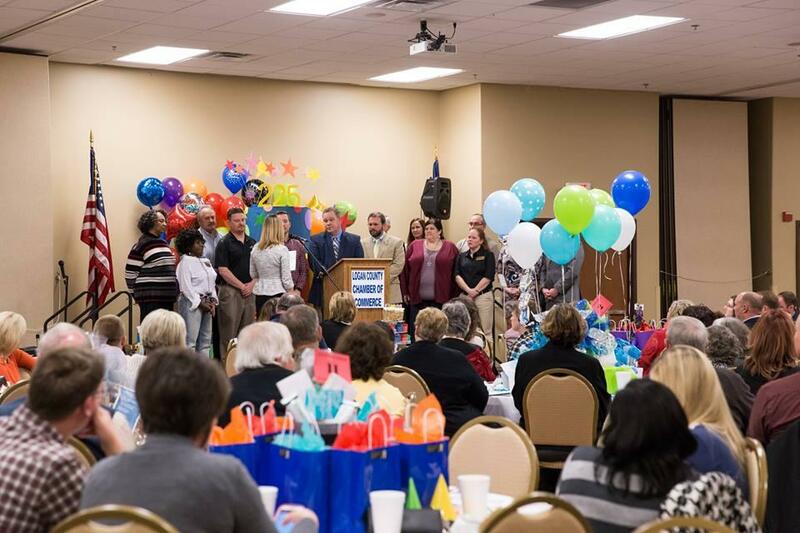 Shown in the photo, from left, are Marie Gamble, Kathy Edmonds, Gary Grohovsky, Shane Hayes, Ethan Holloway, Paul Mullins, Joe W. Hendricks, Jr., Leon Smith, Kristen Herndon, Holli Brown, Leann Martin, Kyle Hines, Mandy Henley and King Simpson. 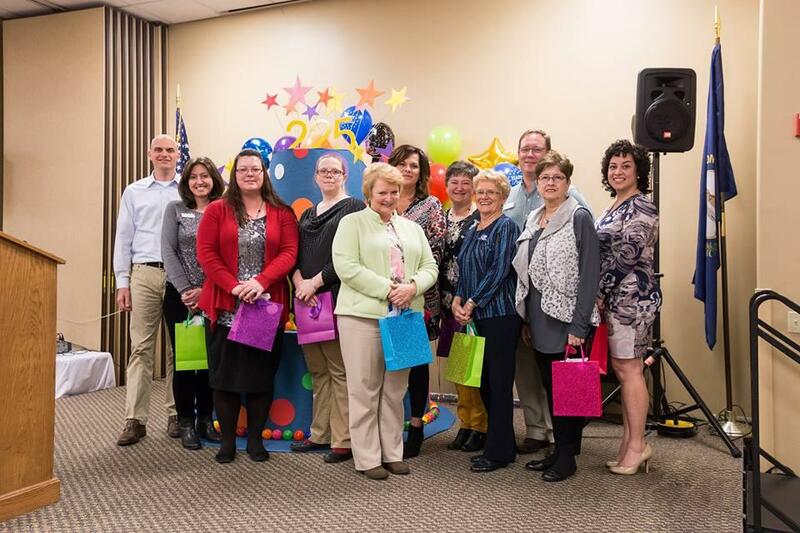 Ambassadors who were present for a photo were, from left, David Clarke, Krystal Gunderson, Julie Wheeler, Rachel Vinson, Mary Ann Henry, Kim Reeves, Stacey Cundiff, Paula Timberlake, Jeff Manley, Martha Lane Wells and Mandy Henley. One tradition is for the former Chamber presidents in attendance to pass the gavel down in order of the year served to the new president. Shown, from left, are Danny Coffey, Edna Hughes, Chris McGinnis, Chris Milam, Sandra Kinser, Brian White, Holli Brown, Brent Summers, Shane Hayes, Joe W. Hendricks, Jr. and King Simpson. One of the highlights was performance of a Kentucky medley of songs by LCHS students Lydia Manley and Jaclyn Batchelor. The duo finished second while singing the medley at the state Beta convention, qualifying them for national competition at Disneyland. Those Kentucky songs—entitled A Tribute to Kentucky—were part of the theme of the evening, which was celebrating the Commonwealth’s 225th anniversary this year. The Russellville Area Technology Center prepared a six-foot tiered birthday cake for the celebration. Batchelor also sang the National Anthem. Grace Baptist Church pastor Todd Latham led the invocation and McCormick, a Retired Army Colonel, led the Pledge of Allegiance. More award members are named and pictured in a separate article on The LoJo.